I installed a ColorDMD (LED) into my T2 and while the actual LED screen works I may have generated some sort of issue during the install such that the video output from the pin isn't working properly. I know the LED works since I can view the ColorDMD menu. During the install I may have had the 16 pin connector reversed or have done "something" else incorrectly that made the game reboot a couple of times. To troubleshoot, I disconnected the ColorDMD and then reconnected the original DMD. At first, the original DMD displayed the graphics, albeit distorted, but after a machine reboot, no graphics at all. Next, I tested the 16 pin ribbon cable, but it was fine. I don't see any blown fuses, either. Any suggestions out there? With any garbled DMD issues always recheck ALL of those ribbon cables multiple times. But the rebooting is not a usual issue. When you say "may have" reversed the cable I wish people would just say what they did. But this should not cause a machine reboot. Check to see if you knocked a connector loose on the power driver board. Also, do you have a bunch of other mods installed? Under cabinet LEDs or anything where you has to tap into the 5v/12v lines? Thanks for the suggestions. No dice yet. I used the word "may" because I am not sure if I reversed the cable at some point, but I am not sure. Typically more information, rather than less, is helpful in troubleshooting problems. Reversing the ribbon won't cause a problem. The display won't work, but it won't damage anything. I know the LED works since I can view the ColorDMD menu. During the install I may have had the 16 pin connector reversed or have done "something" else incorrectly that made the game reboot a couple of times. Did you swap one end of the cable to see what happens? Also, did you download the Chroma file for the display? Make sure you only have the Chroma file on the USB stick, not a colordmd.ROM file. At first, the original DMD displayed the graphics, albeit distorted, but after a machine reboot, no graphics at all. 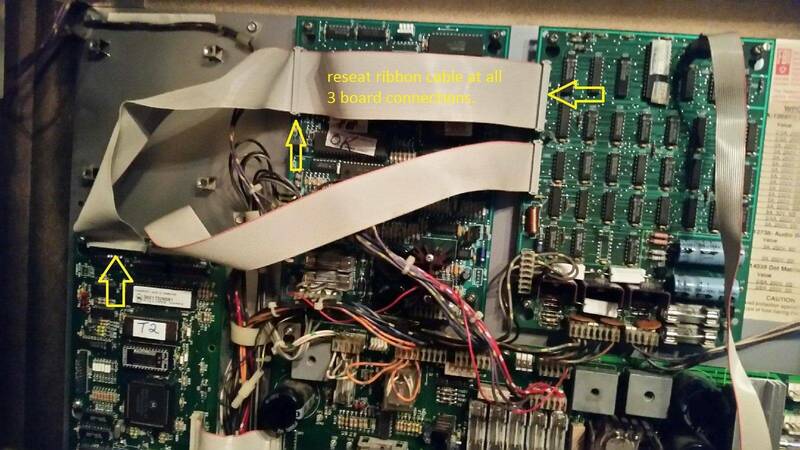 Since it even has a problem with the original DMD, try reseating this ribbon cable. Are any pins loose that the connectors plug into? Sure sounds like a cable issue. I have had a few of those. On my Congo, the old mpu died and replaced it with a Rottendog. Video was fine before but was messed up with new mpu. A new cable helped but still messed up. Tried another cable and it is much better. Getting new cables isn't expensive and nice to have spares if old ones still good. I also suggest actually testing all fuses. They can still look good when blown. Argh. Reseated all of the connections without any change. Thanks for the picture. Unfortunately it didn't help. Yes, I tried swapping one cable end and a new cable. The file is correct/only one on the drive. I have our local pro/pinball repair wizard coming on Thursday to fix this and an EM, for which I'm even more useless. I'll take any other suggestions, though. Would you mind snapping pictures of the boards and the back of the display with the game on? Can you confirm the file on your USB stick is 'chroma.rom' ? The board was fried. The venerable Allan Davidson performed testing and swapped out the board for me. Allan is the man. Any idea what was fried on it?